Organizing your events into categories makes managing your events efficient and it makes it easier for potential attendees to find the event they want to attend. You can also do some neat things with the Event Categories that you wouldn’t expect. Please do not replace or remove the [ESPRESSO_EVENTS] shortcode. Without it the plugin will not function correctly. You can create a new category by pressing the “Add New Category” button at the top of the page. You can edit a category by clicking on a category name in the category overview. Category Name – This is the descriptive term that will display in the event editor. Unique Category Identifier – This should be a unique identifier for the category. Example: “category1” (without quotes). 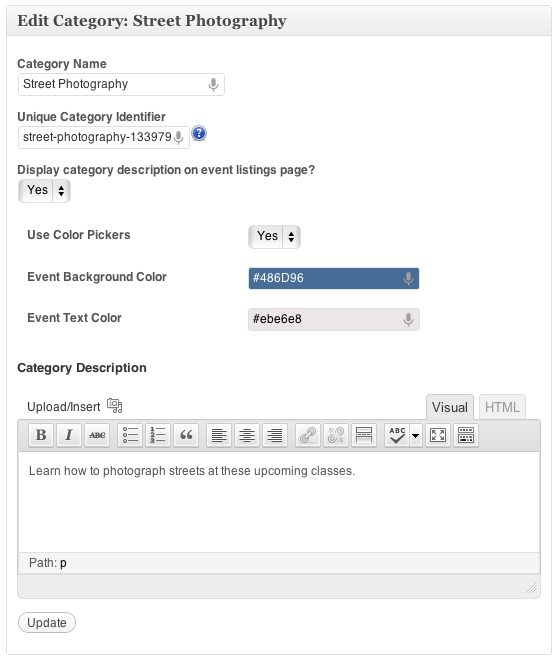 The unique ID can also be used in individual pages using the following shortcodes to generate a list of events in this particular category. The plugin will create an identifier if you forget to but it’s best to set one that is easy to remember/type. Do you want to display the category description on the event listings page? Yes/No – This feature allows you to display the event description when you use the category shortcode to list a particular category of events. Use Color Pickers? Yes/No – This feature allows you to set unique colors for events in each category in the calendar. Set the calendar settings to enable CSS for categories to use this feature. Event Background Color – Set the background color of the event entry in the calendar. Pick a color or enter a hex code. Event Text Color – Set the text color of the event entry in the calendar. Pick a color or enter a hex code. Category Description – The category description can be left empty or be as elaborate as you’d like. 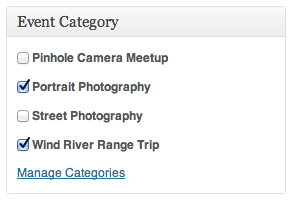 You can assign an event to one or more categories by checking the boxes next to each event category. 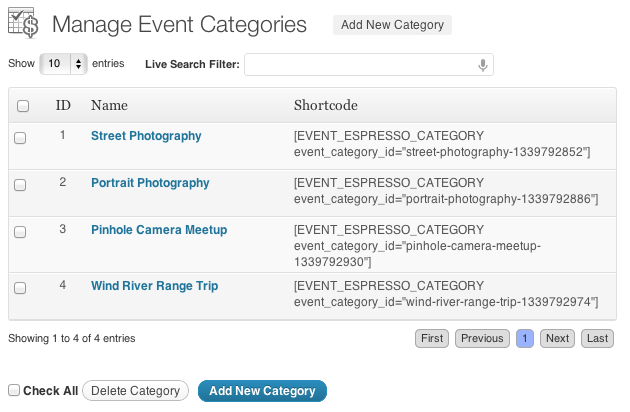 The unique category ID can also be used in the following shortcodes to generate a list of events in this particular category. You can place either of these shortcodes in the HTML view of the page. From here you can see all your created categories, create new ones, and edit and delete existing ones. The Add New Category button at the top allows the creation of new event categories. The name of the category, used in both the front and back end of your site. You can set the category ID here, if left blank it will be automatically set for you. Display Category Description in Event Listing? Choose whether the category description is displayed in the event listing or not. A rich text editor that allows you to create a description with images, html, etc.